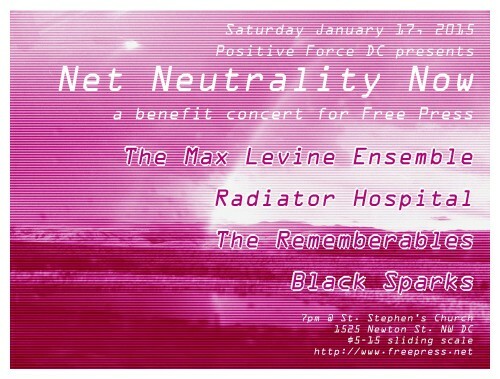 A benefit show for Net Neutrality! After a year of intense activism and public pressure, the FCC is poised to vote on Net Neutrality rules in February. Its a showdown moment — pitting the Comcasts of the world against all Internet users. What the agency decides will determine the fate of the greatest communications medium in history. Serving as a platform to anyone with an idea, the open Internet empowers freedom of speech and freedom of expression and its impact on the creative community cannot be overstated. It has enabled artists to connect directly with each other and with audiences. It has eliminated the barriers of geography and taken collaborations to new levels. And it has allowed people - not corporations - to seek out the film, music and art that moves them. Allowing cable and phone companies total control over this once-open platform shifts power away from individual artists and creators and interferes with freedom of speech and expression. Net Neutrality freedom fighters from the non-profit advocacy organization Free Press will be there to talk about the upcoming battles at the FCC and in Congress to protect the open Internet.